Now for the fun part! The Slinkies team want you to select the winning entry. 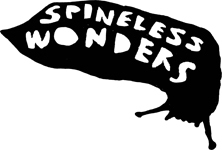 Those of you going to the National Young Writers’ Festival (Sept 28 to Oct 1) will be able to listen to the six audio stories on the Spineless Wonders’ StoryPhones which will be installed, along with ballot papers, at four locations around the city of Newcastle. But if you can’t make it to the festival we also have the six entries on Soundcloud with a link to the voting form on Facebook. The winner and runners-up will be announced at the Wind Down session in Civic Park on Sunday at 6pm. Prizes include a selection of Slinkies and paperbacks and we will be giving away a Spineless Wonders’ gift pack to a lucky voter. So cast your vote online or at the Festival to be in the draw. Slinkies team-member, Emma Howe, has been getting to know the six finalists and has produced a series of interviews so you can get to know them too. Today we are thrilled to introduce Anna Jacobson. What was your inspiration for ‘Potato Stamp’? Who are some of your favourite writers and why? My favourite writers are my wonderful friends (both published and unpublished). I am so lucky to be surrounded by a fabulous community of writers and poets in Brisbane, who are so kind, supportive and talented. The books that I now have on my shelf or stacked beside my bed are by my incredible friends and mentors: David Stavanger (The Special), Pascalle Burton (A Vast Laugh), Felicity Plunkett (Vanishing Point), Nathan Shepherdson (Apples with Human Skin), Sam Wagan Watson (Love Poems and Death Threats), Ellen Van Neerven (Comfort Food), Michael Farrell (Break Me Ouch), Andy Jackson (The Thin Bridge), Carmen Leigh Keates (Meteorites), Rebecca Jessen (Gap), Zenobia Frost (Salt and Bone), Shastra Deo (The Agonist), Michele Seminara (Engraft), Paula Keogh (The Green Bell), Sarah Holland-Batt (Aria), Sarah Kanake (Sing Fox to Me), Kari Gislason (The Promise of Iceland) and MTC Cronin (<More or Less Than> 1-100). What do you like about the microlit form? When I was first recovering from my experience with mental illness, poetry came pouring out as my form of expression. I like how microlit and poetry is a condensed form that often isn’t linear but can be fragmented and non-episodic. Poetry and microlit are both powerful vehicles for imagery, symbolism and metaphor. Did you write ‘Potato Stamp’ specifically as an audio piece or was it originally written for print? I initially wrote ‘Potato Stamp’ for print, but then chose to develop it as an audio piece, as I realised the second voice of the Case Manager/Imaginary Voice would work well in this format. I achieved this effect by creating a two-track piece. When it comes to really short fiction, do you generally start wide and then cut it down or was ‘Potato Stamp’ always conceived as a small piece? ‘Potato Stamp’ originally came to life as a longer poem, which I then edited and condensed. What is the name and personality of the first character you ever created? This had me digging around for my grade four notebook (subject: stories) that I’ve kept all these years— it’s now two decades old! I was ten and had written a short story about two giants: Harry and Thunder. I even make a cameo appearance as Anna (a kind old giant), who gives Harry some money to buy roast beef for his sandwich, as Thunder won’t give him any roast beef (and all Harry has to eat is a honey sandwich). Clearly, food was a strong influence in my writing, and still is!